Sixers guard Markelle Fultz drives against Bucks guard Malcolm Brogdon. We won't waste your time. If you're reading this, you know what Sixers' 2017 first overall pick Markelle Fultz has gone through. Well it's over now. At least what the second year player and everyone else around him hopes. "I am very confident," Fultz said in front of assembled media members Friday ahead of the start of training camp. "I am very excited for the season and to be on the court for longer and be in more games and help my team in as many ways as I can." Fultz went on to describe quite the impressive work regiment — one that often included three workouts a day with trainer Drew Hanlen. There was no "eureka moment" that had him feeling like he had overcome his issues from last season (which, it's worth noting, Fultz called injury-related and not the "yips," as Hanlen recently did). Instead, it took the entire summer. "It was a gradual thing," the guard, who had a triple double in one of his 14 games last season, said. "It was a matter of getting back in the gym and having fun. It was slow, but before you knew it, I was back to feeling like myself. And having been through what I've been through, it was good." Videos are all over the internet of Fultz draining threes and looking like the natural shooter he resembled in college at Washington. But teammate and close friend Joel Embiid checked in on Fultz a few times in Los Angeles this summer and says his teammate will be impressive in more ways than just that focal point. "Everybody talks about his shot," Embiid said at media day. "He worked a lot on his shot this summer, we have the same trainer, when I was in L.A. — I spent a little time out there — I got feedback from Drew. He was working three times a day, he did a lot of shooting and he improved. He got much better. I don't think the whole story of this year is going to be about his shot. I think he has a lot of potential to be more than just a spot up shooter. He's much better than that. He's going to show everyone why he was the No. 1 overall pick." 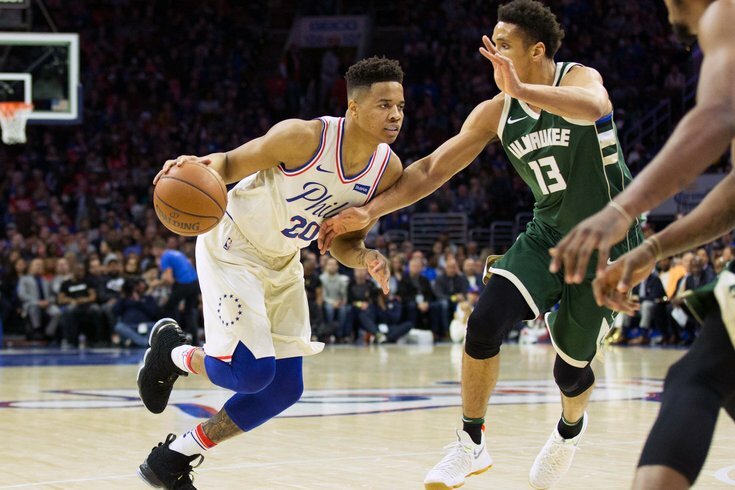 Fultz may have a chance to start — he likely will at some point if he gets close to meeting expectations — and will assuredly take minutes away from the Sixers' other point guard (not including point-forward Ben Simmons), T.J. McConnell. Will that get in the way of team chemistry? Fultz will be hard not to root for after going through what he called "hell" last year — from the incessant media coverage to his inability to get on the floor to the Sixers' mismanaging of his injury, it was a long year. Today it seemed pretty clear that the kid is back and ready to focus on playing basketball. "This summer was one of my hardest working summers," he said. "Everyone knows what happened last summer. It was a very productive summer. I am proud of my work with Drew. I put up a lot of shots and a lot of hours."